It’s not obvious, but your Windows 8 tablet’s Start screen’s version of Internet Explorer often keeps several sites open at the same time. For example, you may be viewing a website and then switch to the Mail app and tap a link somebody e-mailed you. 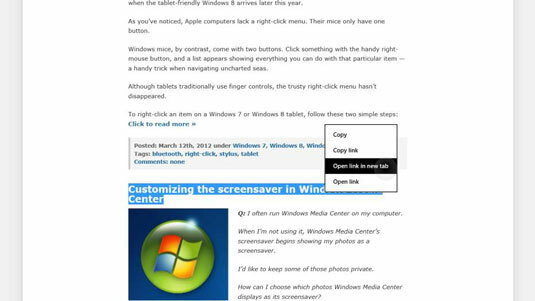 The Start screen’s Internet Explorer appears, displaying the e-mailed website. What happened to the web page you were viewing previously? The browser places it on a hidden tab — a storage place the browser uses to juggle several open sites simultaneously. The browser often opens new tabs on its own, but you can open a link into a new tab, too, a handy trick when you want to visit a page, but keep the first page open for reference. To open a link in a new tab, tap and hold your finger on a link. When a pop-up menu starts to appear, lift your finger. Then from the pop-up menu, tap Open Link in New Tab. To see your currently open tabs, slide your finger down slightly from the top edge of the Internet Explorer app. When the menus appear, the top menu lists all the sites currently open in tabs. To revisit a site, tap its name; the browser switches to that tab. You manually close a tabbed site by clicking the X in the thumbnail’s upper-right corner. You open more than eight tabs. The browser only has room for eight tabbed sites. If you open a ninth, your oldest tab disappears to make room for the newcomer.